The "Southwick" property derived its name from blacksmith Henry Southwick who owned the property for just over five decades (1883-1932). Originally, as is the tradition in small town New England, the property was once known as the "Joseph Taylor" farm. 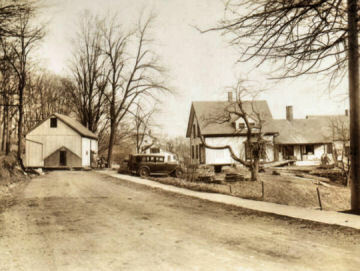 In 1849, Joseph Ballard Taylor, a native of Buckland and carpenter by trade, purchased two parcels of land on opposing sides of Upper Street in Buckland Center for what was to become a farm and place for Taylor to set up his carpentry workshop. The changing environment and economy, in early industrial New England, no longer supported farms by their own volition. Farmers of the day, like Taylor, often subsidised their income with a trade like carpentry or blacksmithing to survive. On the parcel of land across the street from what would become the Taylor's residence sat a pre-1830's blacksmith shop which he planned to convert into his carpentry workshop. 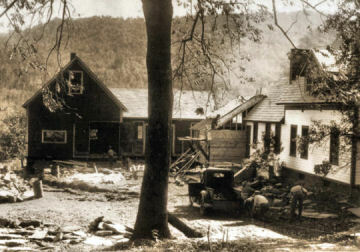 Taylor began building the house and barn in 1849. It was completed in 1850. 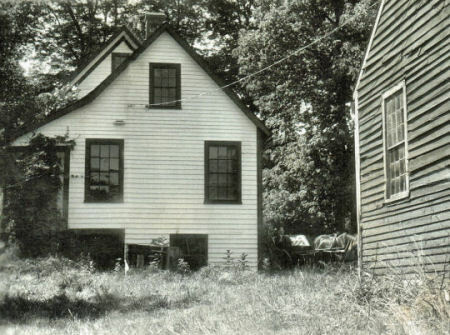 During that time, the blacksmith shop was picked up, moved across the street, placed just behind the house and converted into Taylor's workshop. The house itself was built in the style referred to as Gothic Revival. Gothic Revival was not as popular a choice as its cousin Greek Revival for that period in Western Massachusetts. However, there are four other known homes on Upper Street of the Gothic Revival style suggesting that Taylor, through his trade, may have had a hand in their construction as well. By 1870, the Taylors reportedly had 25 acres of land, they valued at $1,500. The farm consisted of a horse, two milking cows, three other cattle, two sheep, a pig, and produced 50 bushels of potatoes, 8 tons of hay and made 100lbs of butter. Unfortunately, Joseph Taylor died the following year and his wife Jane the year after (1872) leaving their son, only 14 at the time, the assets and property. order to provide Woodward access, via a ramp, to both. In 1874, the boy's guardianship petitioned the courts to sell the property in order to provide better care for the boy, now 16 years of age. 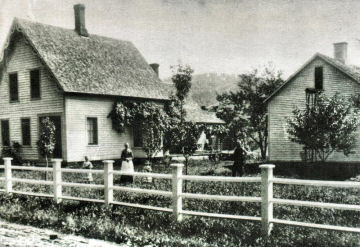 The house and land were put up for sale at auction and was sold for a reported $1,600. After nearly 25 years, the Taylors no longer are part of the farmstead they began. After two brief and unremarkable owners... a blacksmith from nearby Charlemont, Henry Southwick, purchased the farm and land in 1883. Henry, the Southwick Studio's namesake, brought with him his wife Ida and 4 children to raise, restored the blacksmith shop to its original use and tended the farm land for the next 51 years. Ida passed away in 1924, two of the three children moved away, one child died young and the youngest, Ben, stayed for some time.. probably aiding his father in the blacksmith shop before becoming a chemical salesman in White Plains, NY with a family of his own. Henry Southwick continued operating the blacksmith shop shoeing horse and oxen while working the fields as late as 1930 before he passed in 1931. As a result, he property went to his son, now in White Plains, who eventually sold it to Woodward in 1934 for an undisclosed amount. the house from a porch behind the main house. In 1934, Woodward lost his second studio to fire within 12 years, only this time the home itself was also damaged. The only thing left standing of the Hiram Woodward Place was the barn. Woodward needed a new home and studio, despite still owning "The Little Shop" just down the road, it was unsuited and small to be made into a residence. 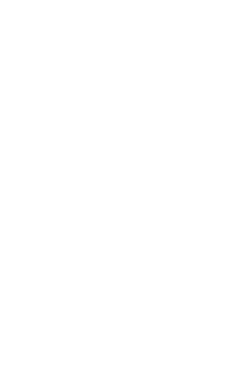 Woodward's purchase of the "Joseph Taylor Farm" from Henry Southwick's son Ben in 1934 would become his last and enduring home and studio until his death in 1957.
moved by two pair of oxen! of the house and raised blacksmith shop. the chicken coop was also moved to be attached to the back of the house aiding the construction of a ramped walkway to the coop and entry of the studio. the blacksmith shop was raised 4 to 5 feet to a position near a level to the rear of the house and attached chicken coop. needing a first-floor bedroom, one was added to the south side of the house to serve as Woodward's bedroom. (most likely with the Boston Arts Club). 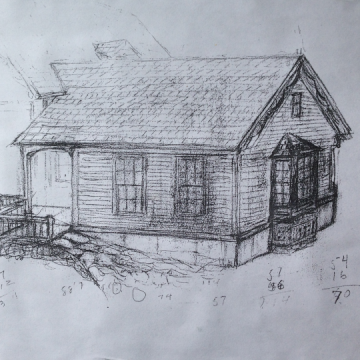 Moore also helped with purchasing The "Little" Shop and Heath Pasture Studio. Moore was an important patron of the arts. She became a patron of Woodward, buying several paintings (New England, and Courage and Peace) and making his work known among her friends, many of whom bought paintings. Moore's patronage went beyond the purchase of his work and introductions to potential collectors. She also established a trust fund for the artist, and its income paid for a full-time nurse and a handyman. To expand his travel range, Moore bought Woodward two cars, a Nash in the late 1920s and a Packard Super 8 Phaeton in 1936. Her financial and social supports were critical to Woodward's success as an artist. In fitting with the tradition of its time, the new residence and studio of Woodward was affectionately referred to as the "Southwick Place." Southwick became a social center for the artist as he held dinners for friends and prospective clients in all seasons, and at least once entertained the poet Robert Frost who owned a Woodward painting, Winter Dignity and close friend, actress Beulah Bondi made frequent visits. 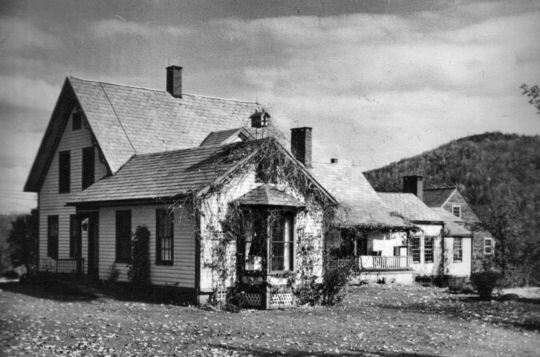 Reconstruction of the Southwick Place was completed in 1936. 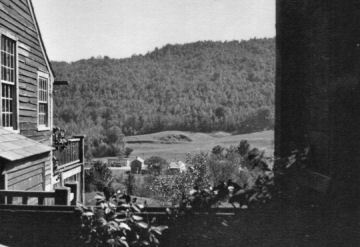 The residence not only provided Woodward with the freedom and comfort of mobility, its spot on a sloping hill overlooking the valley supplied Woodward many inspired vistas and subject matter. 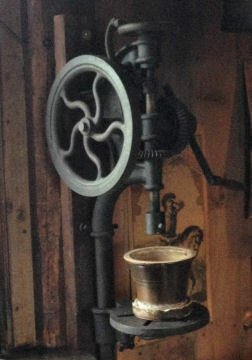 There are numerous works of art painted from multiple windows throughout the house but none more prevalent than his famed "Window Picture" paintings from his beloved studio, the blacksmith shop.